For Embedment in Concrete. This Short Base Section is set into a hole, with concrete poured around it to provide a Bolted Connection to the 55G Main Tower Section. This Tower Section uses double bolted joints which are proven to be the best method of joining tower sections for sturdiness and dependability. Featuring a 17" equilateral triangular design, the SB55G is constructed of extra heavy duty 1-1/2" steel tubing side rails with continuous solid steel rod bracing. The 55G tower can be used guyed, self-supporting or bracketed configurations according to specifications in the ROHN Catalog. As a guyed structure, it can rise to a maximum of 400 feet. Self-supporting and bracketed heights depend on loading and are also specified in the ROHN Catalog. 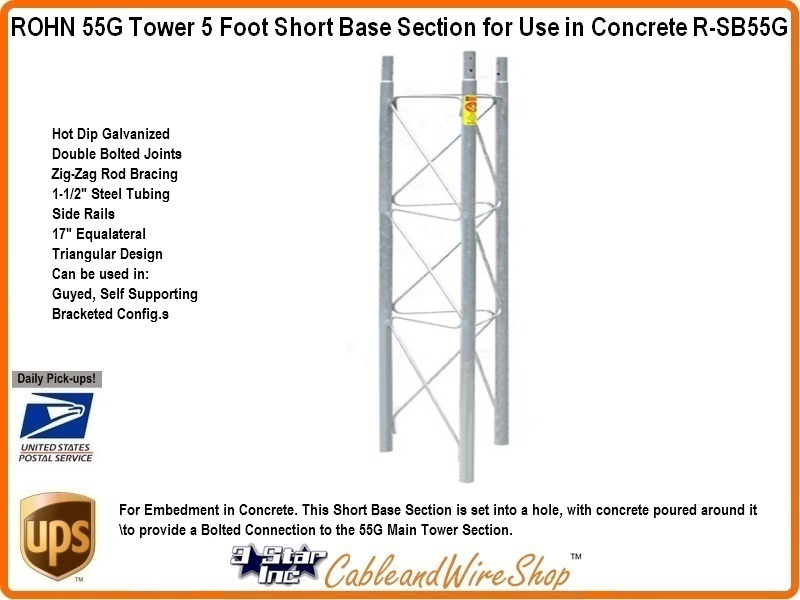 Note: Be sure to check out the suggested Concrete Base Pier Specifications and Maximum Self-Supporting 55G Tower Height found on our ROHN Catalog Links in the Footer below.